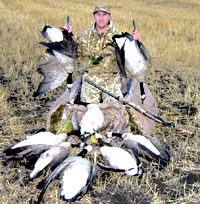 Wild Times Guide Service is owned and operated by Phil Brown and Jim Szemenyei. Phil and Jim have been guiding in the Klamath Basin since 1989, 10 years of which were spent running the West White Lake Duck Club for professional baseball player Kevin Gross. 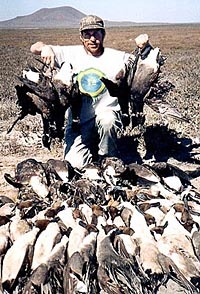 After the private lease for the duck club was sold to the USFWS in 1999, Phil and Jim formed the partnership and lauched Wild Times Guide Service. Phil and Jim have been featured in Stoney Wolf Production's Hunting with the Pros, ESPN's Suzuki Outdoors with Will Clark, and Primos' The Truth About Waterfowl series, and of course Dirty Jobs ! True waterfowl addicts, Phil and Jim Have hunted all over the U.S. , Canada , and Mexico We take pride in our observation skills and calling abilities and are always happy to pass on what they've learned.We are full time guides , hunting and fishing is all we do ! Wild Times Guides Service is licensed in California and Oregon and hold two of the five permits issued by the USFWS, allowing them to hunt Lower Klamath and Tule Lake refuges. They also hold a BLM permit. Wild Times Guide Service is also fully bonded and insured, and both Phil and Jim are trained in First Aid and CPR.